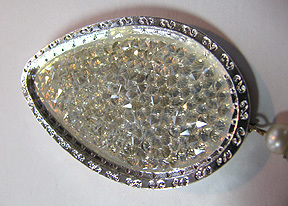 Instant Glam bezels are large and in charge! No joke. These bezels, created by Fernando DaSilva and Metal Complex, will make your head spin with the possibilities. I joined in the project hop which my friend Carmi hosted, and I was instantly in love with the bezel. 1. 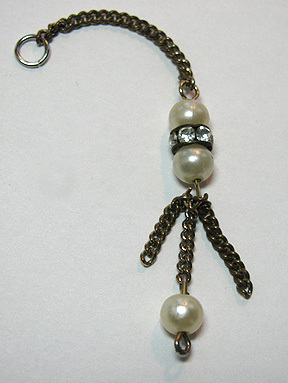 The bezel has a loop on the back, near the top, so I hooked together some vintage chains and glass pearls so they could form a dangle. 2. 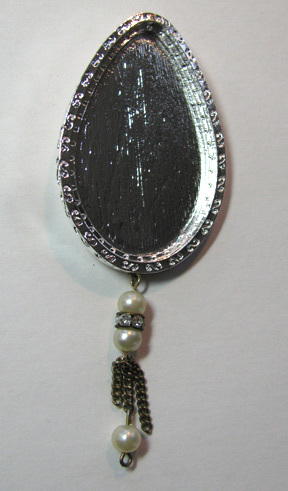 Using a bit of two-part resin, I attached the crystal rock piece to the bottom of the bezel. It was pre-cut to this size and shape. 3. 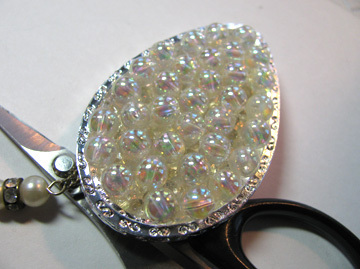 I used vintage "bubble" beads, which have an iridescent finish, very popular in the 50s and 60s. Once I had them situated, I used a needle-nosed pair of tweezers to tip them so the holes don't show. I poured a very thin layer of resin over and around them just to hold them in place. The pair of scissors in the photo is just being used to keep the bezel level...there is a loop on the back which sticks out slightly. 4. 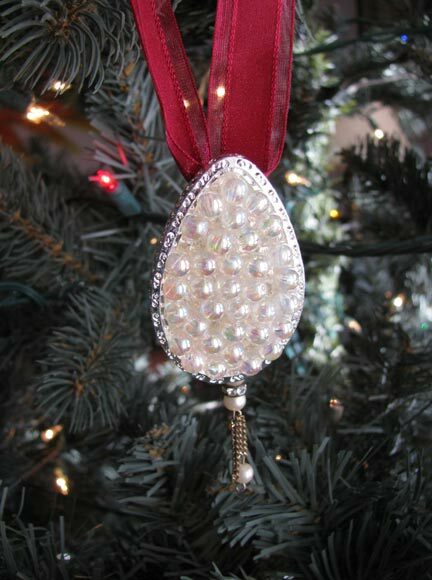 To finish, I simply added a ribbon bow that would allow the piece to be hung on my Christmas tree. As regards FTC disclosure guidelines: I have received a bezel and crystal rock insert free of charge from Metal Complex in order to write a review and/or create a project free of charge for you. I have not been paid for my endorsement as it pertains to the products received. Great job. I love your new ornament. oh my gosh, your ornament came out gorgeous! Thanks so much! I really fought against the idea of layering them, because it seemed like a "waste" of the crystal rocks. But I wish you could see it in person...the sparkle is quite amazing because of them!